The New York Times bestselling author of THE AVIATOR'S WIFE returns with a triumphant new novel about New York’s “Swans” of the 1950s --- and the scandalous, headline-making and enthralling friendship between literary legend Truman Capote and peerless socialite Babe Paley. Of all the glamorous stars of New York high society, none blazes brighter than Babe Paley. Her flawless face regularly graces the pages of Vogue, and she is celebrated and adored for her ineffable style and exquisite taste, especially among her friends --- the alluring socialite Swans Slim Keith, C. Z. Guest, Gloria Guinness and Pamela Churchill. By all appearances, Babe has it all: money, beauty, glamour, jewels, influential friends, a high-profile husband and gorgeous homes. But beneath this elegantly composed exterior dwells a passionate woman --- a woman desperately longing for true love and connection. Enter Truman Capote. This diminutive golden-haired genius with a larger-than-life personality explodes onto the scene, setting Babe and her circle of Swans aflutter. Through Babe, Truman gains an unlikely entrée into the enviable lives of Manhattan’s elite, along with unparalleled access to the scandal and gossip of Babe’s powerful circle. Sure of the loyalty of the man she calls “True Heart,” Babe never imagines the destruction Truman will leave in his wake. But once a storyteller, always a storyteller --- even when the stories aren’t his to tell. Truman’s fame is at its peak when such notable celebrities as Frank and Mia Sinatra, Lauren Bacall and Rose Kennedy converge on his glittering Black and White Ball. But all too soon, he’ll ignite a literary scandal whose repercussions echo through the years. 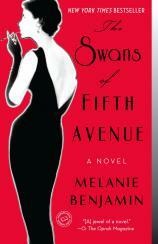 THE SWANS OF FIFTH AVENUE will seduce and startle readers as it opens the door onto one of America’s most sumptuous eras.